A few days a go I received an email from a local chamber of commerce that a town that they work with is no longer showing up on Google Maps. None of the businesses show up and when you perform a search on Google for a business within that area, it will give you the closest location, but obviously not the one you are looking for. This is not the first time that this has happened and I believe it comes from data getting indexed and going through the maps algorithms. How long will it take to get back up? Great question. The best way is to let Google know on their support forum. I have had very good experiences with Google getting back to me on questions and issues I have had problems with. So, the moral of the story is, “You get what you pay for”, but I would highly recommend if this happens to your city or town, to ask a question on the Google support forums and patiently work through the problem. 1) How long has the web designer been in business? You would be surprised how many “web design” shops have popped up and dropped off. Even in the Minneapolis area. Now, that is not very “Minnesota Nice”. We have seen and heard of companies looking to make a quick buck and then leave businesses high and dry when they cannot fulfill their empty promises. Do a little bit of research on how long the company has been around. You will thank yourself in the long run. 2) Give them a call. Don’t just sign up because they have built up hype on their website. Give them a call and see how you get along with them on the phone. How do you feel after the initial conversation? Is this someone who you would like to work with? If you decide to go with this company, you will probably be with them for a while, so it would be in your best interest to see how they relate to you. Another factor to keep in mind is if they even pick up the phone. You may have experience with companies that give the complete “song and dance” and then when it comes time to get back in touch with them (after they have your money, of course) they are impossible to get a hold of. 3) Are they in the search engines? Now, there are many reputable web design companies that do not rank highly in the search engines for the popular terms. After all, there are only around 10 spots, right? However the ones closer to the top probably have a little more experience/expertise in structuring a website so that it can be displayed higher in the search engines. They know a few processes that have proven themselves successful in getting a higher placement in the search engines. You should at least be able to search for their company name and their website should be listed. After all, wouldn’t you like to see your business higher in the search engines? 4) What is the budget range? Most of us have a budget range we would like to stick within for anything we go out and buy. Want a car? Chevy Cobalt or Bentley? You get the idea. Most Minneapolis web design companies are the same way. We have heard some agencies charging $20,000 plus for a relatively simple website and we have also heard very low prices. Wow, that is quite a range. We would recommend finding a Minneapolis web design company that you feel comfortable with and can get what you want for a relatively good price. I don’t think any web design company would like to build a site that was way under priced for the work involved. As you are already aware, most of the time, you get what you pay for! 5) View their website portfolio. Do you like some of the work they have completed? I know many Minneapolis web design companies that have killer portfolios. Do you really need a complete knock out website? Or do you need more results from your website? Either way, view their portfolios and see what they are capable of and see if it fits in your budget range. Past clients and their experience is a great way to see how others have been treated in the past. You can learn much from a few testimonials listed on a Minneapolis web design company’s website. We know it works! Come to think of it, I look at testimonials on every website I plan on buying from. Look for the testimonials! So, before you jump right in and get that website built by the first company that crosses your screen, follow these tips and see if you can hone in on a Minneapolis web designer. You will thank yourself in the long run. You will end up saving money and build a better relationship with a company that you will do business with for a long time. I believe everyone by now has heard of the recession that we are all in. Some businesses have fared just fine. Some have gone out of business but one thing is certain, it is not pretty out there. We have also felt the recession mainly because we work with businesses of all shapes and sizes and some have been hit pretty hard. Lately though, we have seen some light on the horizon and it seems as though things are picking up out there. The time frame I’m speaking within is about January 1, 2009 through August 24, 2009. We talk to many businesses and early this year we heard many stories that businesses were cutting back. Any B2B (business-to-business) can most likely agree that it has been a little slower lately. Lately though, the business owners we have been chatting with are opening up to the idea of spending more money and increasing their business. This is a great sign for anyone in the advertising industry, partly because in a recession scenario, advertising is one of the first things to be cut. While businesses deal with the current economic conditions, you can bet they are looking for ways to stay in business. This usually means that businesses that can help them spend less and be more efficient will be in demand. You can also expect that most of the businesses that are choosing to do nothing during a recession will be going out of business. This will also mean that the customers that those businesses served will be looking for other companies to complete the work. If your businesses is able to pull through these tough times, I imagine the internet and a great sales staff will be key to the survival. You can also expect the internet to grow, even through the recession. People will tend to stay at home and use tools that they are already paying for. They will also be looking for additional ways to save money, ways to educate themselves, cheaper products and services and coupon shop. All of this brought to their doorstep by the internet, courtesy of web designers everywhere. Send out a mailer to businesses you’d like to work with. Add on a great offer. Think of where your potential customers might go to find more information about the industry you serve. Send an article to a magazine that they read. Chin up! Charge the mountain! Staying motivated is necessary in a recession climate. Keeping all sales staff on top of their game and looking at the bright side of what is happening can have a positive effect on your business. Recessions are part of today’s economy. If you structure your business the right way, you will roll right though a down economy and be in a position and pick up business that your used-to-be competitors dropped. Organic Search Engine Listings and P.P.C Search Engine Listings: How can they benefit my web site? What is all this talk about how the search engines can help my business make sales? If you are wondering how the search engines can benefit your business in terms of ROI, you’ll want to pay attention and find out the main differences between the two types of internet advertising. First, the main search engine we will be talking about is Google. Google has a majority of the market share when it comes to searches made on the internet. There are other search engines which have similar programs, (such as Yahoo or MSN as well as others) but in our opinion, at this time Google does the best job of coming up with the most relevant results. We will use them as an example so you have a better idea of what to expect when advertising your web site on the internet. Organic listings are the results that come up when a person conducts a search on Google. The organic results come up in the middle of the page, or the left of the screen, however you view it. Organic listings are the web sites that are most relevant to the words used by the person’s search. It is rumored that Google’s search algorithm looks over 200 factors to gauge how relevant a web site is when relating it to keywords that a user types into their search engine. We recommend that companies leave it to a professional web design company to make the best use of your money. PPC stands for “price per click.” This type of listing is located on the right side of the screen when Google search results are displayed. Companies set up an account with Google and they let customers bid on keywords. When a customer bids on a certain keyword, Google looks at what others are bidding for the keyword and then circulates your ad with others according to an algorithm and the amount of a person’s maximum price per click for a given keyword. This type of campaign can be done by anyone, but just like anything else, what you are paying for is some experience. If you don’t know what you are doing, a PPC campaign can cost huge amounts of money and have very little return on your ROI. If you have the time to set up a PPC campaign and do the research then try it out. Otherwise you might be interested in hiring a professional web design company that knows how to optimize and outperform the competition to make the most of your online advertising budget. What’s better Organic or Price Per Click? To say one type of listing is better than the other is incorrect. Like anything else, a little of each is the best in our professional opinion. We believe that (and have seen a trend) that suggests that PPC will continue to grow and be the fastest way to have a web site listed higher up in search results and in front of customers who use Google to perform searches. Although most people look at organic listings, the ability to appear on the first or second page is getting harder every day. Competitors are putting more and more money into trying to achieve first or second page status on competitive keywords. It is definitely possible to rank on the first or second page of Google, but be prepared to open your wallet. What products or services are most profitable for your company? Should I hire a professional or should I try this myself? What type of image do I wish to portray? The main goal of the campaign should be very clear. It is necessary to know what you are trying to achieve so that the steps that follow will be a smooth sequence, be consistent and will not confuse your potential customers. The budget you have available is another key consideration to look at when thinking of taking your web site to the next level of internet advertising. Don’t think that you will have an organic first page Google ranking for a competitive keyword for $20. You are investing in your business, not buying a t-shirt at a circus. Clients usually spend between $100-$2000/month to get decent rankings for organic rankings as well as PPC. The name of the game is ROI. A $2000/month online advertising bill is not much, when it could possibly bring in $15,000-$25,000/month in new sales. When considering an online marketing campaign, be sure to look at which items or services make your company the most money. For example, if you have a construction company and your average profit for a roofing job is $1,700 and your average profit for building porches is $5,000, then you should obviously advertise both, but emphasize porches. Invest your time in building the part of your business that makes the most money for the time invested. The question of whether a company should track the optimization by themselves is a question that should be answered before the campaign starts. Are you going to put a full time staff member to take care of all the factors in implementing and running your online advertising? Who is going to take care of updating the web site and links? What tools will you use to make sure you are making the most of your online advertising campaign? What about all the other aspects relating to showing up higher in the search engines? All in all, there are many factors that go into optimizing and advertising your web site online. I wouldn’t even think about building a house by myself. The amount of time and energy invested would be overwhelming, not to mention the tools, knowledge of city building codes and permits and teams of people that are needed to accomplish a project of that size. We recommend that you let a professional organization take care of your web site optimization and marketing. 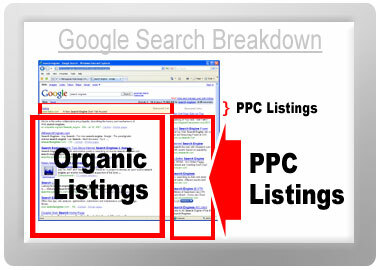 In conclusion, there are many factors to consider when comparing the organic and PPC search results. Organic search results are based on the web pages’ relevancy to the keywords typed into the search engine. PPC is a quick way to have a site listed on or near the top and it is based on the keyword chosen and the highest bid for that keyword. It is recommended that organic and PPC are used simultaneously to reach different types of consumers who look at each type of listing, to draw the most visitors to your web site. We highly recommend that clients wanting to start a search engine campaign talk to a professional web design company that has experience with search engine optimization and search engine marketing that will help achieve the maximum return on investment and stretch their marketing dollar as far as possible. In the end, making yourself easy to find makes a difference. Your clients will thank you for that by helping build your business. We hear it all the time…”My brother (son, grandma, uncle, etc.) knows how to build web sites and they do it for cheap! Why would I have a professional build my web site?” The sad truth is that eventually the majority of these companies wish they would have started with a professional web design company. And all while the company is not getting the results they had hoped for. It is easy for us to understand why a company would shudder when thinking about hiring a professional web design company: affordability. In this article we point out some of the things to take into consideration when you have a web site professionally built. The time and money are better spent on dealing with a professional in the field that knows these areas. Those in business know that time is money. Do the math! You are here to find out how to build your business. Your neighbor down the block does this in his spare time…who would you want to do business with? These are just a few areas that are analyzed when you decide to work with a professional web design company. Some areas are obviously more important than others. The company’s goals for the web site have much to do with the priority of each of the areas. For example, I wouldn’t even think about designing and building my own cabinets. Considering the time it would take me to build a cabinet myself, it would be a better business decision to hire a professional carpenter or cabinet supplier to build my cabinets, so I can focus on my core business. Likewise, you have a core business model which you should be focusing on so that your business grows. Let the pros do their work, so you can focus yours. You are reading this article to get an education about possibly making a business decision in the future. Your neighbor down the street does this in his spare time (and their work on your business web site will show it)…Who do you want to do business with? Who would you work with to showcase your professional image? When you work with professionals, you get professional results and the peace of mind that it is doing what it is supposed to do. Having an online presence is not enough. Your web site should be optimized for the search engines. Google, Yahoo and MSN, are just a few of the search engines the professionals work with. Professional web designers have industry knowledge that help your web site rank higher and be more useful to customers. Your web site should be easy to read and to navigate. The layout should be attractive and the text should be readable. One characteristic that professional web design companies focus on is the future expandability of the web site. This is very important when looking at the overall design. There are many packages available that will help you build a web site, but when the support for that package goes away or they go out of business, all the money that you invested into your web site is gone with the package. The professionals use industry standard coding practices so their code can be easily understood. This translates into a higher value web site that is faster to expand and grow, saving you and your business time and money. In our experience, the businesses that don’t invest in a professional web site eventually wish they had invested in a web design company. Considering all the important factors listed above, it is highly recommended to look closely at the benefit of working with a web design professional. The task of building a web site and having it work for your business is too time intensive for non-professionals and the business simply won’t get the results they had hoped for without spending much time and effort learning the techniques that work well for businesses on the internet. In conclusion, your job is to build your business which takes both time and energy. Save both and let professional web design companies use their time and energy to help build your business the right way. Have our team come up with a great custom website for your business or organization! Countless satisfied clients! Increase traffic from the search engines with SEO! Customers are searching for services you have to offer. Help them find you! Tired of page timeouts from your old hosting company? Step on board for great, reliable service! "You have certainly met my expectations in designing my website and in some cases went above what I envisioned. Your sense of urgency to complete the job and make changes as needed are just a short list of reasons you are a successful business. Thanks for taking the stress out of it." "Midwest Web Design offers a fast, easy and professional way to develop a presence on the Internet." A word from Midwest Web Design, Inc.